In most Grand-Am events and other motorsport races, qualifying and pole position plays a significant factor. In races such as the GT2 class in ALMS, where racers and cars are so evenly matched, pole position is even more important. In a race like the Rolex 24 Hours of Daytona, while qualifying plays a role, it's not as important as endurance and proper set-up. And indeed they do. The #67 TRG/Flying Lizard Porsche 911 GT3 Cup of Joeg Bergmeister, Patrick Long, Johannes van Overbeek and Seth Neiman is set to start seventh as one of the three (3) Porsche's set to start in the top 10 of the GT Class. In the grid with the #67 TRG/Flying Lizard Porsche is the top Porsche qualifier of Kelly Collins. Collins put the #66 TRG Porsche 911 GT3 Cup within three-tenths of a second of the pole, but could not penetrate the one-two-three Mazda qualifying results for a fifth place start. Collins will share driving duties with Andy Lally, Ted Ballou, Wolf Henzler and Patrick Flannigan. “With Porsches’ 63 class wins and 37 class and overall wins for the Porsche 911 at the Rolex 24, we know that our teams have set up their cars for the long haul, and both our race cars and street cars and their components have a solid reputation for endurance,” said Paul Ritchie, president of Porsche Motorsport. Wedged squarely between the two TRG Porsches in sixth is the #88 Orbit Racing Porsche 911 GT3 Cup of Johnny Mowlem, Guy Cosmo, Tom Papadopoulos, John Baker and Lance Willsey. 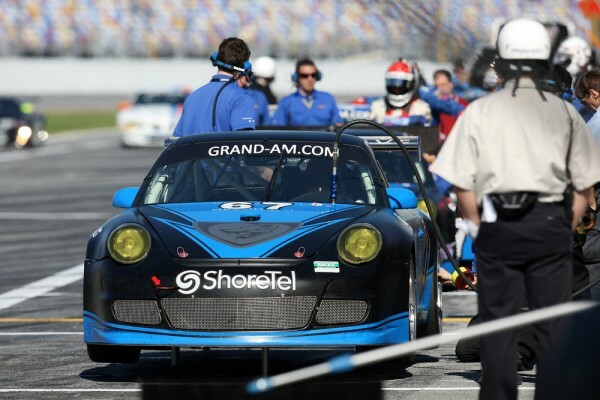 Overall, the qualifying event for the 24 Hour race was the closest in Daytona history in both the GT and DP classes. Darren Law, from Phoenix, Ariz., put the #59 Brumos Porsche Riley in the seventh spot on the grid, less than a second from pole-sitting V-8 Ford Dallara. Law, who, along with David Donohue, Antonio Garcia, and Buddy Rice won the race overall last year, feels that the car is well set up for the race, and has confidence that this year’s Brumos drivers know how to win a 24-hour event. “Butch Leitzinger, a three time winner, Raphael Matos, my regular co-driver David Donohue, and Hurley Haywood, the American endurance legend, all know what is needed to win. We have the crew and the car to win, and we hope the drivers can bring home a victory,” said Law. The Rolex 24 at Daytona will take the green flag on Saturday, January 30 at 3:30 p.m. EST, with coverage live on SPEED TV starting at 2:00 PM EST. Live SPEED coverage will continue until 10:00 p.m., and then resume at 7:00 am EST on Sunday morning, January 31 through the end of the race at 3:30 pm EST. SPEED will then stay on the air until 4:00 p.m. to cover the post-race activities.